As part of our church’s centenary celebrations a booklet was printed in 1994 describing the building and its background. It was entitled ‘A brief guide’ and is now reproduced in part here. This is a church whose roots lie under a different name, elsewhere in Seaton. May you feel at peace in the company of the Lord in this place of worship. 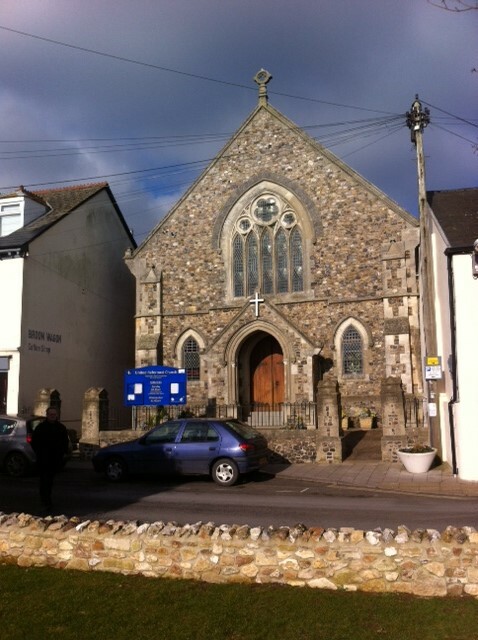 According to the directory entitled ‘William White’s 1850 Devon’ it is stated that “At Seaton is a Wesleyan and also an Independent Chapel; the latter built in 1822.” According to the church records it would appear that in the year 1825 ‘the Cause was started by a student from the Western College, in what is now Mr James’ yard’ and there is also a reference that the first sermons were preached in the chapel, known then as the Independent Chapel, in Fore Street in the year 1825. A letter received from the Congregational Historical Society in 1954 stated that their earliest reference to the Seaton chapel appeared in the Evangelical Magazine, 1831, being a letter from the Rev. John Gleed, the first known Minister, who came to Seaton in July, 1828. He raised a congregation and Sunday School, and organised a church. We are fairly certain that the site referred to is where the Co-op shop in Fore Street is now situated, and if you stand in Fore Street, facing west, opposite the shop and look up you will see the old chapel windows still in place (in 2015 for Co-op shop read Osbornes). At some stage the members of that Independent Chapel became known as Congregationalists and in 1893, in order to worship in more suitable premises, a site for a new place of worship was purchased in Cross Street. On Thursday 27th September 1894 the foundation stone of this current building was laid at the south-west corner, and the new church was opened one year later, on Thursday 26th September 1895. In 1971 the church members voted in favour of a merger with the Presbyterians and in 1972 the United Reformed Church came into being. Structurally the front of the church is of flint, with Bath and Beer stone dressings, and the side and end walls are composed of brick panelling, both inside and out. On entering the building, as you cross over the vestibule and pass through either of the doors facing you, you find yourself in a beautiful, but simply decorated, church. The church proper is seventy-two feet long by thirty feet wide. and seats three hundred people (some back and side pews have since been removed). The pulpit and pews are made of pitch pine. There is a large Gothic window set into the south facing wall of the church above the gallery, and at each side six other windows supply light through cathedral tinted glass. The roof is ‘hammer beam’ with a height to the wall plates of eighteen feet, and to the wooden ceiling of twenty six feet. As you proceed along the left hand aisle you see the control unit for the amplification system which was installed in 1993 (subsequently updated). Prior to this date the controls were positioned further forward and a plaque on the wall refers to amplification equipment which was installed in 1980 in memory of Mr. & Mrs. G.A.Johnson, Mrs. Doreen Widgery and Mr. Cyril Culling. The original amplification system was installed in 1937. The cost of installing the amplification loop system in the church, and also in the church hall, in 1993 was met by Miss Maureen Turner of Colyton. 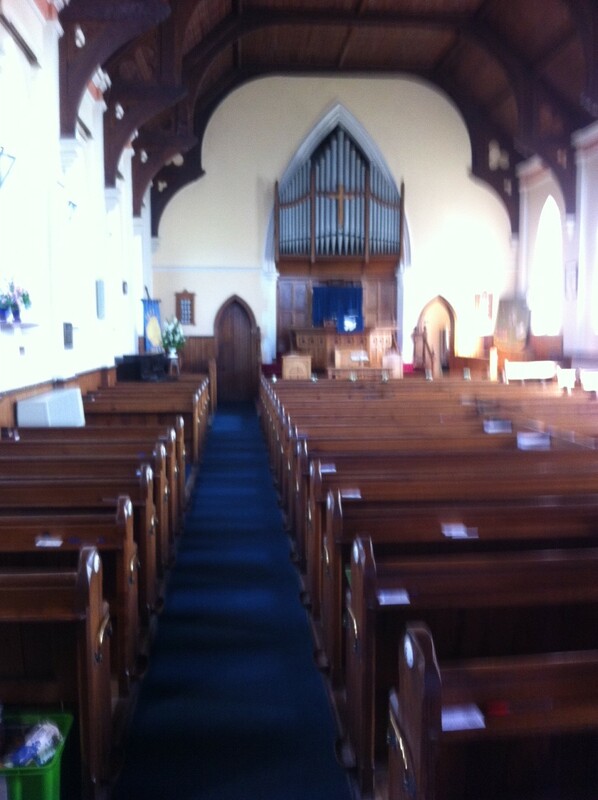 You will see that several side pews have been removed to make room for heaters which were installed in 1988. On the west wall is a plaque in memory of Clifford Charles Gould, Justice of the Peace, member of Seaton District Council for forty four years, and its chairman for twenty three years, who died on the 4th July 1939. Moving along the aisle you can see that more side pews have been removed to make permanent room for a piano which was donated by Mr. John Mitchell, as a source of music ancillary to the organ. This change was made in 1987. The baptismal font on a pedestal that stands by the choir pews was donated by Mrs. Daphne Overmass in April 1965 in memory of her parents, Mr. & Mrs. Charles Overmass. 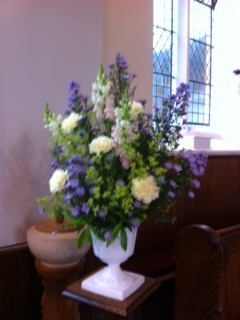 In 1986 two flower pedestals were donated by Mrs. Ethel Gosling and are used to effect in various parts of the church. Doors in the north wall lead to the Minister’s Vestry and to the Choir Vestry, the latter leading through to the church hall. The hymn number boards were donated in1915 by Mr. Gould. In 1991 Mrs. Beryl Clare donated the two wrought iron vase holders, which are positioned on either side of the organ, in memory of her husband, Mr. George Clare (these were later removed as water from the vases overflowed and damaged the walls). The organ was installed in 1909 by George Johnson & Company from Bristol. An electric blower was added in 1927 and replaced in 1964. A brass plaque on the organ shows the blower to be in memory of Miss Elsie Newton, an organist of the church for thirty five years. The organ curtain was donated by Mrs. Holland in 1990. On the front of the organ is sited a wooden cross given to the church in 1981 by Mr. Charles Cearley in memory of his father. A plaque on the cross reads “In loving memory of a dear husband and father Jack Edward John Cearley. January 1896 – July 1976”. The pulpit microphone was donated in 1970 by the Mutter family in memory of Mrs. Elizabeth Ann Mutter. Our first Pastorate Minister, the Rev. Rosemary Humphrey made two pupit falls as a farewell gift in 1987, one showing a dove and the other showing Alpha and Omega with tongues of fire. These were for alternate use to a blue fall with a gold cross presented by the Ladies Committee in 1978. A pulpit bible, King James Version, was presented on the 6th June 1965 in affectionate memory of William and Lucy Gould, who were lifelong worshippers at this church. On Easter Day 1980 a Revised Standard Version pulpit bible was presented by Mrs. Mary Culling in memory of her husband, Cyril. The pulpit shows evidence of where two flambeaux were fitted in 1928, a gift from Mr. Frank Akerman. In addition to the font, a new communion table was also presented by Mrs. Daphne Overmass in April 1965 in memory of her parents. On the communion table is an open bible donated in April 1978 by Mrs. Beryl Clare. The inscription reads ” in affectionate memory of George Sidney Clare, Church secretary 1965 – 1976″. The communion chairs, matching the communion table, were presented to the church in 1969 by Mrs. Ruth Howe and a plaque reads “These chairs were given by members of the family of Claude Grey Cornish and Margaret Anne Cornish, his wife, as a token of their loving remembrance and thanksgiving for all they were to them and to their church, of which they were devoted members for over 30 years”. On the east side of the church you come to a banner depicting local scenes, which was made by Junior Church teachers and then dedicated on the 16th March 1986. Nearby a plant stand donated in memory of his wife by Mr. Robert Bailey carries a plaque which reads ” Sacred to the memory of Winifred M. Bailey 2nd May 1980″. More pews were removed in 1980 to accommodate the piano, which in 1987 was relocated to make room for wheel chairs entering from the rear of the church. On the east wall is a framed picture of ‘The Good Shepherd’ embroidered by Mr. Edgar Webber in 1968. Further along there is a memorial tablet presented in 1933 by Mrs. Overmass in memory of her husband, John Frederick William Overmass, brother-in-law of William George Gush. Above there is another, presented by William Gush’s father, which reads “In loving memory of William George Gush, Captain 7th Battalion Royal Fusiliers, only son of George and Emily Hannah Gush, and grandson of the late Rev’d. W. Phillips, killed in action at Carvelle, France on the 23rd April 1917, aged 23 years”. Electric lighting was installed in the church in 1928, replacing a gas system, and in 1934 the electricity supply was converted from direct current to alternating current. In 1965 lights hung from the ceiling on long flexes, and the two flambeaux on the pulpit, were removed and adjustable spotlights were fitted on the pulpit side of the roof beams, twelve on each side of the church. Four separate spotlights were fitted beneath the gallery, above the rear pew, but these have now been removed. Four close ceiling fittings were positioned in the gallery itself. The Revised Standard Version bibles in the pews were presented in December by Mrs. Jepson in memory of her husband, Kenneth Buchan Jepson. Large-print versions were donated by Miss Eileen Mutter in memory of Mrs. Phyllis Webber, her sister who died in October 1986. The Revised English Bibles in the pews were donated by Mr. & Mrs. Ken Rodgers in 1993. 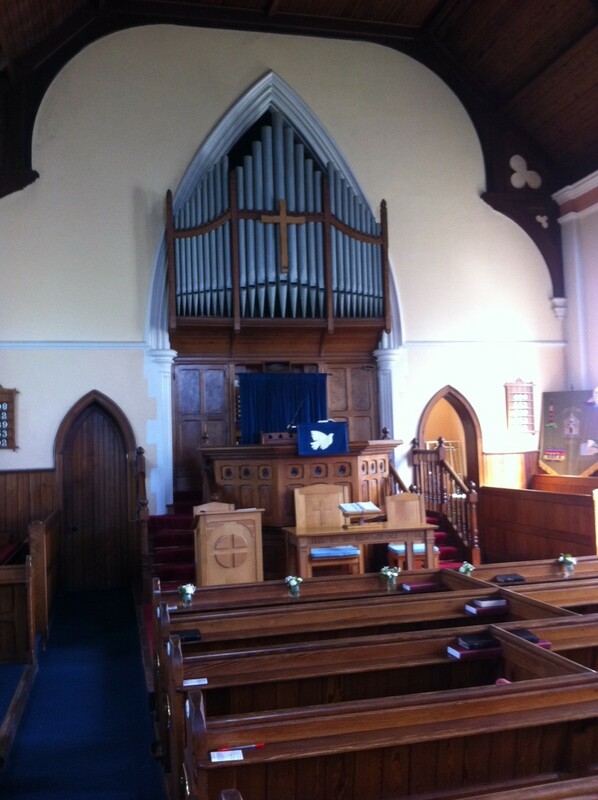 The blue pew cushions were made by the ladies and friends of the church in 1990. The ‘Rejoice & Sing’ hymn books, purchased in 1991, replaced the ‘Congregational Praise hymn books and Mr. Stanley Westbrook made a generous donation in this regard in memory of his sister, Mrs. Flo Coombe. For many years it was felt that the vestibule ought to be enlarged to its current size and in 1992 Mrs. Mary Culling, who wished to commemorate her own family, proposed that, at her expense, the church vestibule be enlarged by removing the back row of pews and moving forward the screen at the rear of the church. The success of this difficult technical operation exceeded all expectations and has transformed the impression gained on entering the church. 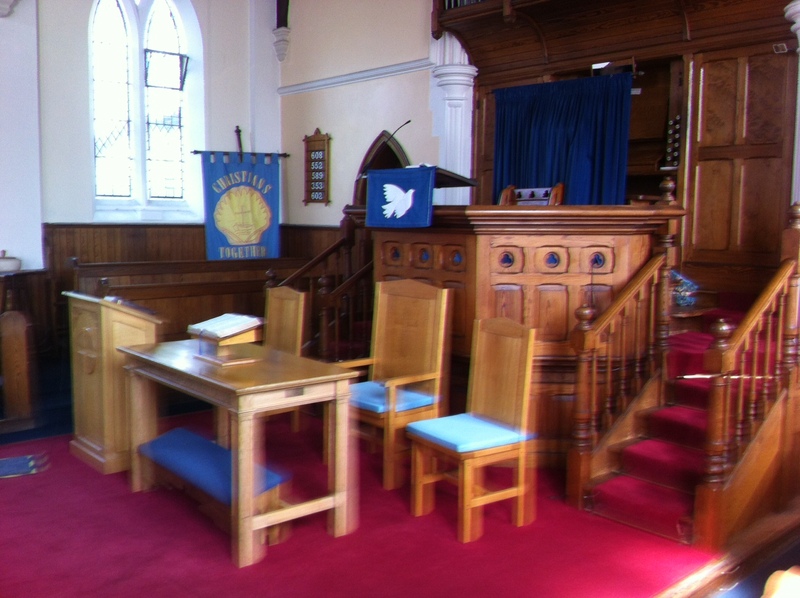 In the vestibule you will see a framed tapestry of ‘The Last Supper’ which Mr. Edgar Webber made and donated in 1984. By the side of the front door is a plaque showing that “The cross and porch lights were given in memory of Arthur Francis Wonnacott by his wife and children and of John Hannah by his wife and son, Christmas 1960. A tribute to their faith and courage in gratitude for their love and high example”. John Hannah was the father of the Rev.John M. Hannah, Minister of this church between 1953 and 1963. I march 1943 the original iron gates in front of the church were claimed for the war effort, and new gates were donated by Mrs. Clarke in 1960, in memory of her husband the Rev. Ernest H. Clarke. The wheel chair ramp leading from the pavement was constructed in 1989. 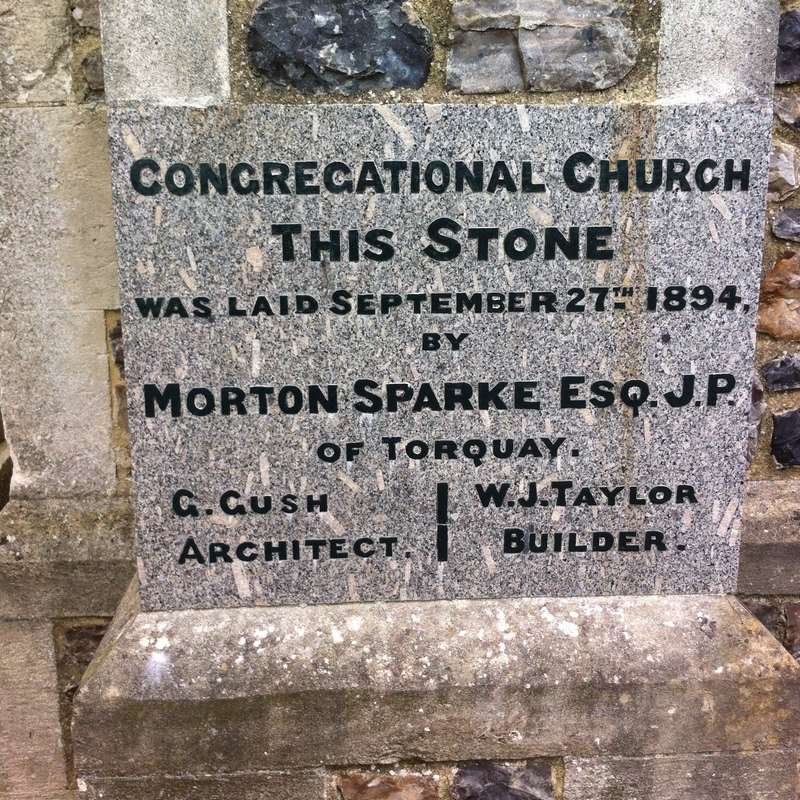 The grey granite foundation stone in the south-west corner of the building was presented by the builder, Mr. W.J.Taylor, and bears the inscription: “This stone was laid Sept. 27th, 1894, by Morton Spark, Esq., J.P..Torquay. G.Gush, architect. W.J.Taylor, builder.” Unfortunately Mr. Spark was unwell that day and the stone was laid by his deputy, Mr. Henry Gadd, J.P.